Deputy Prime Minister Tharman Shanmugaratnam, Finance Minister Heng Swee Keat, and Communications and Information Minister S Iswaran are to attend the 2019 World Economic Forum (WEF) from Jan. 22 to 25 in Davos, Switzerland. This year’s theme is “Globalization 4.0: Shaping a New Architecture in the Age of the Fourth Industrial Revolution” that will include over 350 sessions. Ministers Tharman, Heng, and Iswaran would participate and speak at various sessions, on issues about global trade and financial governance, infrastructure development, the digital economy, and artificial intelligence, as issued in a press statement from the Prime Minister’s Office. Mr Heng will be a session speaker on China’s Belt and Road Initiative on Tuesday, as well as during the global geopolitical outlook on Wednesday. The finance minister will also be a speaker on globalisation hosted by the National University of Singapore and Nanyang Technological University, to be attended by about 200 WEF delegates. Officials from the PMO, the Finance Ministry and the Ministry of Communications and Information will .be part of the entourage of the three ministers. Singapore, for the second time, will be sending three ministers to WEF. Back in 2008, Prime Minister Lee Hsien Loong, then Minister for Foreign Affairs George Yeo, and then Minister for Information, Communications and the Arts, Dr Lee Boon Yang were the delegates. PM Lee, who was ASEAN chair, attended the ASEAN High-Level plenary session, where a dialogue between the regional bloc’s leaders and WEF participants took place. Last year’s WEF was attended by Tharman and Chan Chun Sing, who was then the NTUC Secretary-General. Singapore was the ASEAN Chair for last year, prompting for both of them to outline Singapore’s priorities for ASEAN. Several major political leaders will not be attending this year’s forum. US President Donald Trump, who was last year’s main attraction, will not be around due to the ongoing US government shutdown. British Prime Minister Theresa May and French President Emmanuel Macron also expressed their no attendance. China President Xi Jinping will be sending Vice-President Wang Qishan instead. The 92-year old broadcaster Sir David Attenborough will be the oldest participant for the forum. The World Economic Forum, based in Cologny-Geneva, Switzerland, was founded by German engineer and economist Klaus Schwab in 1971 as a not-for-profit organization. It gained formal status in January 2015 under the Swiss Host-State Act, confirming the role of the Forum as an International Institution for Public-Private Cooperation. The forum aims to improve the state of the world by bringing together business, political, academic and other leaders to shape global, regional and industry agendas. 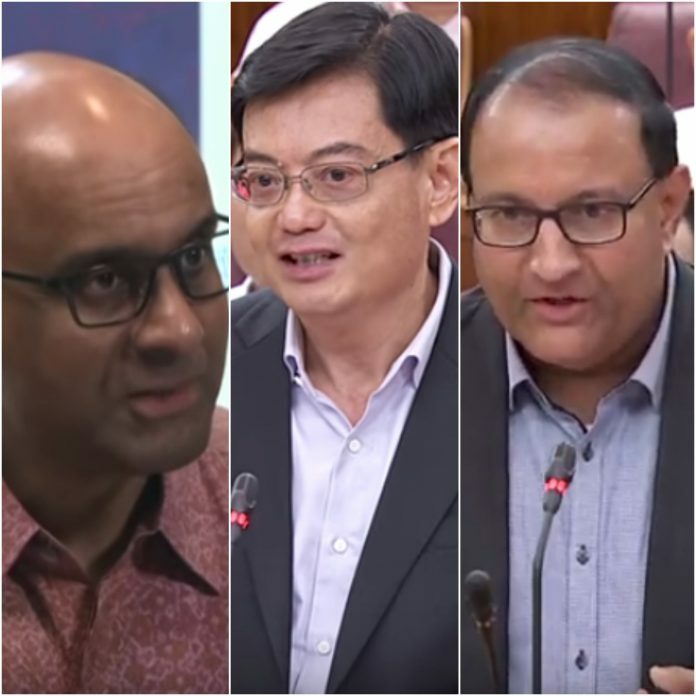 On the other hand, Singaporeans were sending off these three ministers, who will represent the country to the international arena, with a sense of achievement for the country.